A little while ago I documented the remodeling of an entire kitchen for just under $5000, an undertaking that, while done on a budget, was also completed with a small nest egg of money that had been set aside for the sole purpose of putting towards a new kitchen. But what if your budget for remodeling an entire house fell into the $5000 range? It is in that type of situation that, once again, the fortitude to commit to hard work (and the temporary loss of your evening and weekend leisure time) will reward you. 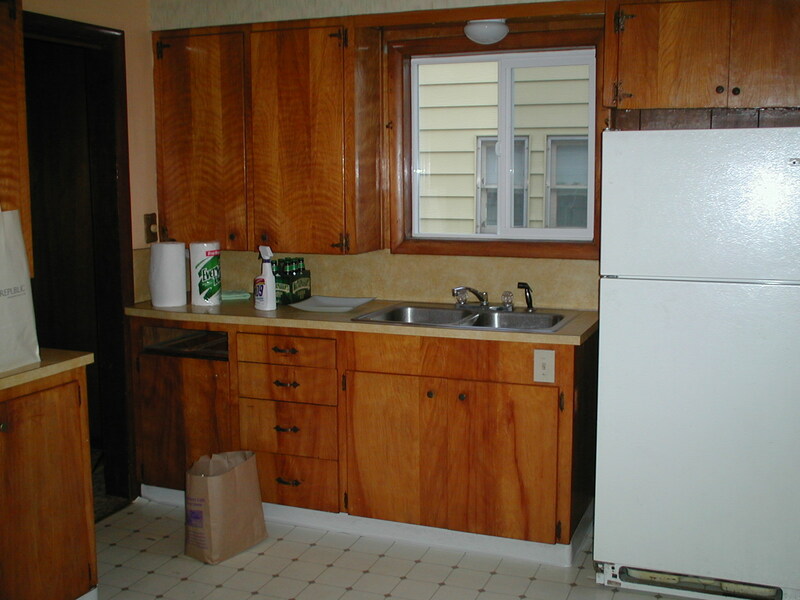 This was the kitchen that came with David’s 1926 bungalow. The kitchen was not original to the house, and, like many other parts of the home, seemed to have undergone a remodel sometime during the 1970s. 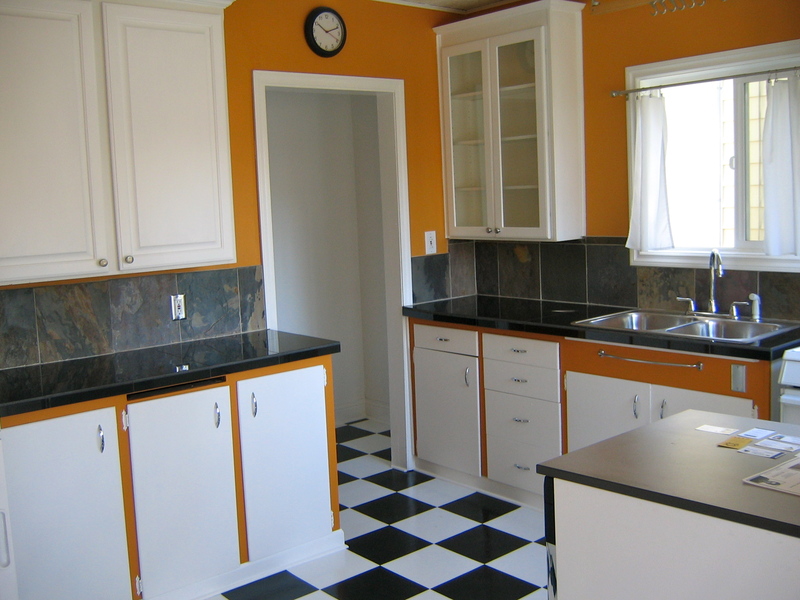 The cabinets were heavily lacquered and sticky with years of grease and neglect. The laminate countertops were peeling up at the corners, and the sharp metal seams that connected the laminate backsplash were viciously rusty. 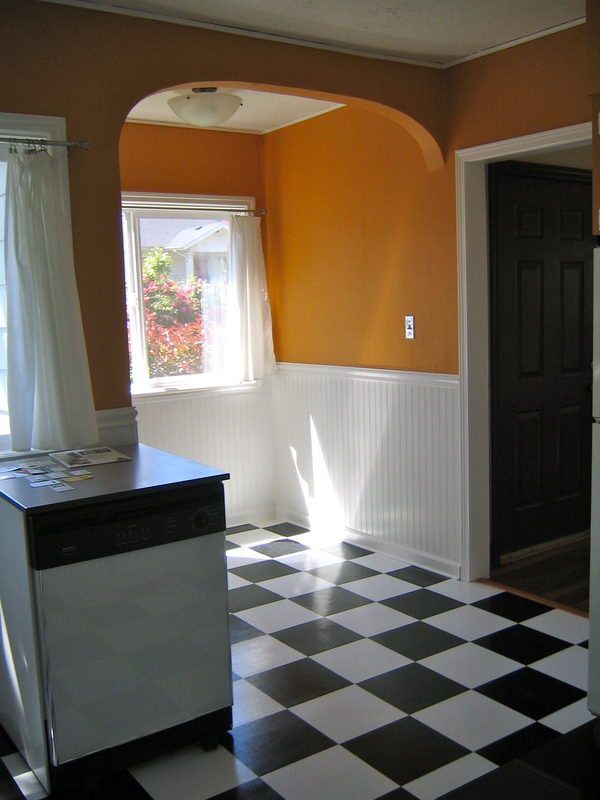 In addition to featuring several different types of both wallpaper and wood paneling, the kitchen also had a very strange, and very inconvenient, layout. The refrigerator blocked one half of a large window on the south side of the room, and the stove sat alone along an interior wall. The first thing David did was swap the locations of the stove and the refrigerator. The second thing he did was purchase a new refrigerator, on account of the fact that moving the old refrigerator unearthed the long-ago decomposed body of a mouse that was hidden in the refrigerator’s drip pan. After the appliance swap, attention was focused on the kitchen’s layers of paneling, wallpaper, and acoustic ceiling tiles (the tiles were not dropped down, they were just glued to the plaster ceiling). It took months of work, but after endless sessions of late-night scraping, peeling, sanding, and patching, the walls and ceiling were ready to be repainted. Along with the walls being painted, new wainscoting was installed on their lower halves, then painted a crisp white. The upper cabinets were removed and replaced, and the lower cabinets were then sanded, primed, and painted. 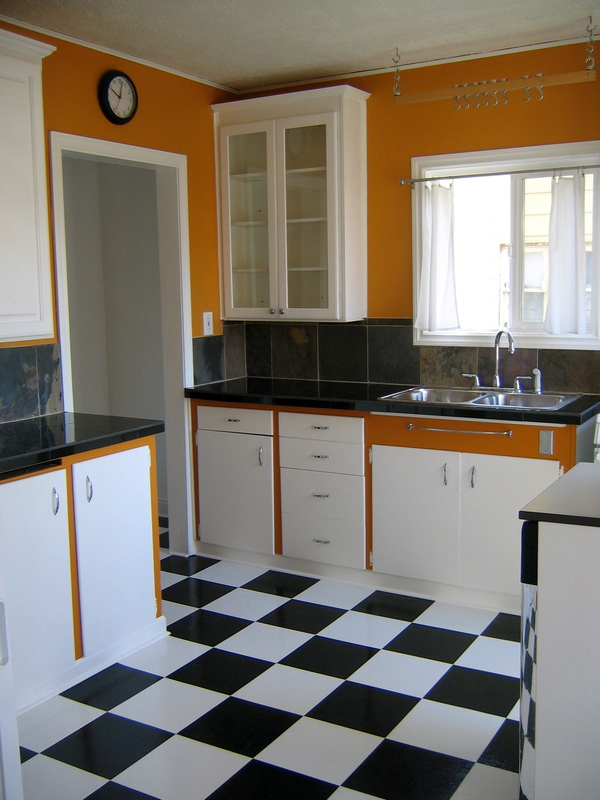 After the kitchen was completed, there wasn’t a single surface in it that hadn’t been replaced or refinished. The upper cabinets were found at the ReBuilding Center, and all they required was a light coat of paint to brighten them up. David also added a small perimeter of crown moulding to the tops of the cabinets, just to made them look more finished. The stove and portable dishwasher were given to him for free by friends who were upgrading to newer appliances. 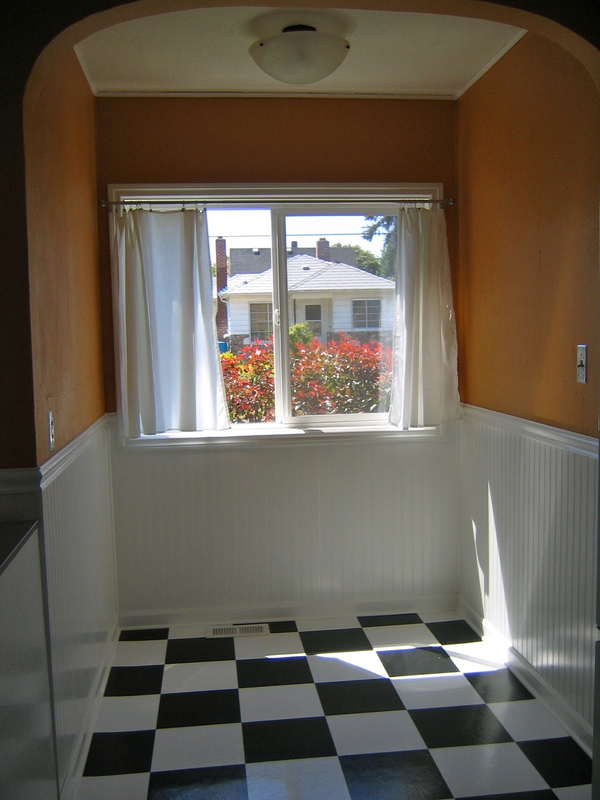 The sink and faucet were replaced for around $75, and the curtains were handmade from old tablecloths. The granite tiles for the countertop were found on sale at Home Depot for around $1.50 a square foot. The slate backsplash tiles were another Home Depot sale find. David bought three boxes of mixed tiles for under $1 a square foot. 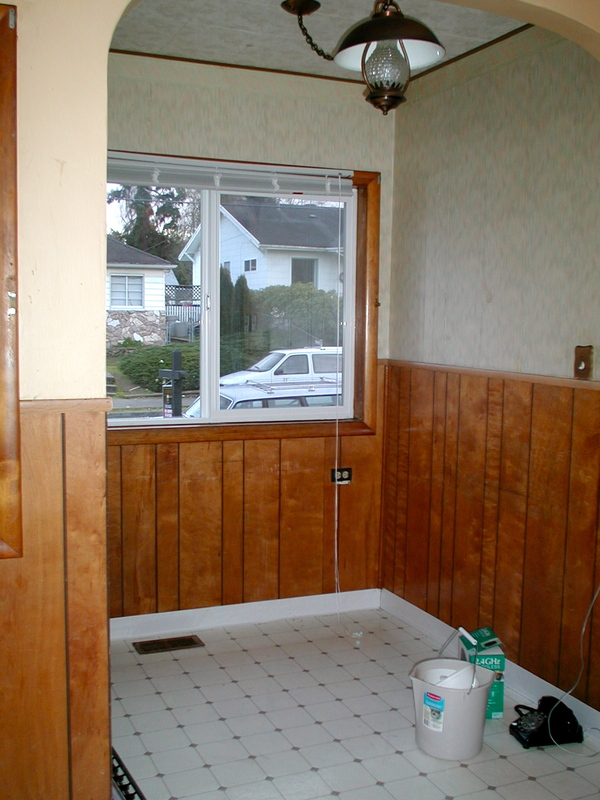 The kitchen’s old eating nook was a sea of wallpaper, faux wood paneling, cheap trim, and one very questionable light fixture. Once the space was gutted and refreshed, the nook was reborn as a bright and welcoming corner in an equally friendly new kitchen. The most shocking thing about this entire kitchen remodel (aside from the incredible brightness that was achieved without adding windows or additional lighting), was the fact that the purchase of the new refrigerator accounted for nearly 45% of the total cost. If you subtract the $300 for the fridge, everything else that was done in the kitchen priced out at around $400. 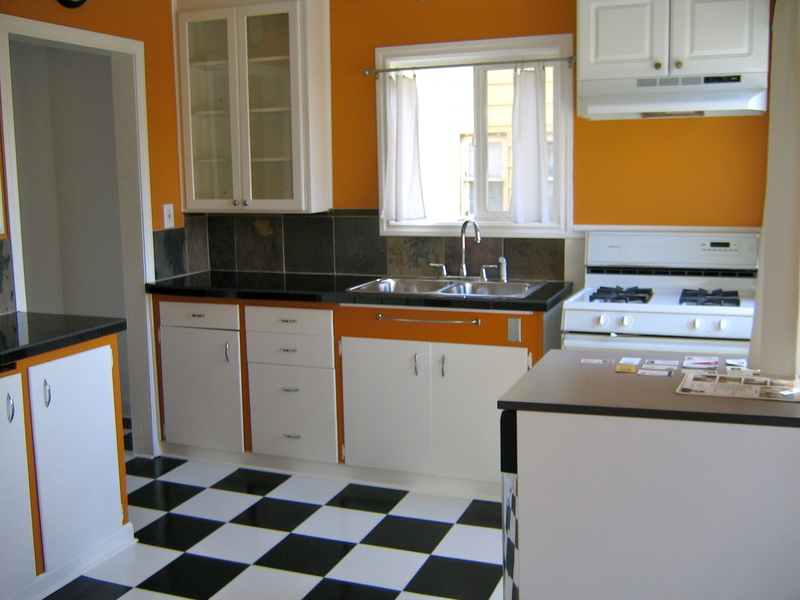 While it’s true that a great deal of money was saved by not having to pay for the replacement stove and new dishwasher, it must also be noted that by not hiring contractors, painters, and tilers, this kitchen remodel was achieved for 1/10th of what it might have otherwise cost. Many weekends may have been sacrificed, but I don’t imagine David–or his wallet–ever mourned the loss of those days.